When I was younger, if I had a Sunday morning baseball or soccer game, I attended Mass at Our Lady of Lourdes Church on Cedar Grove Avenue in the New Dorp Beach section of Staten Island. The church was conveniently located right next to Miller Field, where thousands of kids and parents congregate on weekends for sports, picnics, sunbathing and more. Right now, if you ascend the steps of Our Lady of Lourdes, a landscape of breathtaking devastation unfolds before you. Muddy water. Wind-battered bus stop signs. Waterlogged couches. Discarded appliances. Pulled-up rugs. Sand. People like Lou Cummiskey. I attended Our Lady Queen of Peace grammar school with Lou’s son, Danny. A 40 year-resident of New Dorp Beach, Cummiskey has served as an Ancient Order of Hibernians treasurer as well as an organizer for the Staten Island Irish fair. In 2007, he helped a man from Derry return a Purple Heart medal to the family of an Irish immigrant New Yorker who believed the precious military memento had been lost forever. Cummiskey has also worked with the Irish Political Prisoner’s Children’s Holiday program which brings kids from Northern Ireland to America. Now, Lou Cummiskey has no home. “They got a red tag,” Danny Cummiskey told me this week, referring to the seal left by city officials deeming his parents’ house unsafe. “It’s been hard,” Danny added. “This is Katrina in New York.” (To help the Cummiskey family visit this website). New Dorp Beach - a five minute drive from the home in which I grew up, and where my mother and sister still live – was decimated by Hurricane Sandy. For days, officials were looking for - and finding - dead residents after the superstorm hit. In neighboring Oakwood Beach, one of my cousins was forced to evacuate after Sandy’s merciless tide flooded the home. Last week, there were no picnics, no baseball games at Miller Field. It was strewn with ocean debris and served as a staging area for volunteers and rescue workers who unloaded trucks full of food, clothes and other necessities for New Dorp Beach residents. They had spent the bleak days after Sandy desperately, angrily demanding much-needed help. And now there’s cold weather, and another nasty storm to contend with. 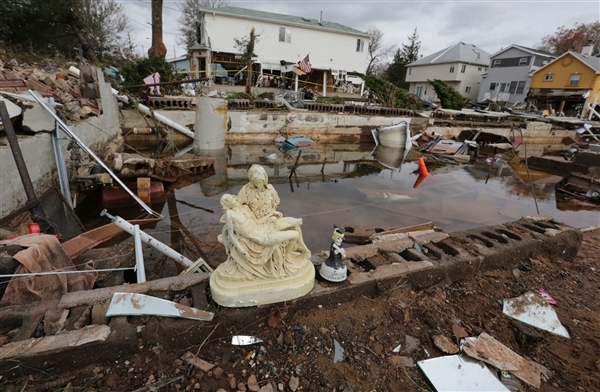 The entire Northeast will be sorting through the debris left in Sandy’s wake for months. But Staten Island will never be the same after Sandy. A small part of the world which had already been immeasurably scarred by 9/11 - a memorial with an angel and American flag was erected a few years back in New Dorp Beach - must now dig out from an unprecedented natural disaster. A landscape that I literally grew up with has been changed forever. My parents used to live down there. I used to go fishing on a long, rocky jetty located in New Dorp Beach. I played baseball at Miller Field and softball at the Bob Illig Memorial Field on Cedar Grove Avenue. For three years, my wife lived in an apartment in nearby Oakwood Beach – this after being flooded out of another apartment on Father Capodanno Boulevard during a 1992 Nor’easter. That boulevard, located just a stroll from New Dorp Beach, through Miller Field, will forever be linked to the most enduring tragedy of Hurricane Sandy -- a mother, Glenda Moore, whose car stalled on Father Capodanno Boulevard. She attempted to carry her two and four year old sons to safety, but a massive wave knocked the boys out of her hands. They were discovered dead days later. Their father is a native of Co. Donegal. Until last week, Father Capodanno Boulevard, running along Staten Island’s Midland and South beach areas, was a place of fond memories. There were softball games with friends. Trips to the adjacent playgrounds, boardwalk and beach with my own children. Back in the eighties, thousands of teens would congregate along “Father Capodanno” - as the locals call it - to do things the brave Vietnam vet priest for whom the road is named might not approve. We did what teenagers do -- drink, fight, laugh, fall in and out of love and listen to music really loudly. There were no cell phones. No Facebook. Somehow we managed. Driving along Father Capodanno Boulevard this week brought only sadness. Vast swaths of sand and mud still on the streets. Traffic lights that still don’t work. Piles of trash pulled from waterlogged homes. And we haven’t even mentioned the place my parents took me - just as I now take my own kids - when we needed a break from Staten Island. Point Pleasant. Seaside Heights. The Jersey Shore. Of course, people will recover from Sandy. Streets will be cleaned. New homes will replace old ones. The Cummiskey family, like so many others in New Dorp Beach, is rallying around those in need. But Staten Island’s waterfront communities will never be the same. Fond memories of the past will grow fonder, if only to help cope with the grim reality of the present. As for the future, it may be uncertain, but one thing is clear -- New Dorp Beach residents should not be forgotten. Go to www.gofundme.com/1gemg4 to help the Cummiskey family. Otherwise, donate blankets, food and clothing, especially for young children. Help ensure that communities such as this are not lost forever.